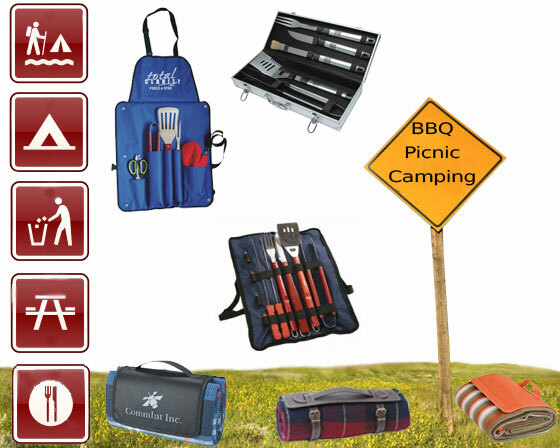 Promotional Picnic, BBQ and Camping Accessories are essential products to have all year round. With summer coming up, outdoor adventures such as camping, family picnics and BBQ’s are ideal ways to promote your brand. Vivid Promotions has a large collection of Promotional Picnic Rugs and Printed Picnic Blankets. A popular branded low cost Picnic Rug is the Barrington Picnic Rug which is made from top quality Tartan weave and also features a unique waterproof backing. Sit back and enjoy the scenery on a family picnic with Vivid Promotions’ Pacific Picnic Rug which has a soft fleece surface and waterproof nylon backing. Brand your picnic mat bag with up to a 2 colour print for maximum brand exposure. Carry your picnic blanket in style with custom carry bags featuring shoulder straps. Picnic Cutlery Sets last a life time, with Forks, Spoons, Serviettes, a cheese board and waiters tool your next picnic will be one to remember. Everyone loves a BBQ, great food, great friends and now with great cooking utensil sets, Choose from a range of stylish branded BBQ and Apron Sets containing stainless steel comprising forks, spatulas, tongs, grill cleaner and black cotton apron. Print your corporate branding on the outer side of this handy fold up set. The branded Adventure Trifold BBQ Set is a custom printed BBQ must have including a 600D Polypropylene velcro clip case which can be custom printed with your company logo. Branded BBQ Kits made from stainless steel materials can be engraved, giving the Barbeque Kits a unique and modern look. Have some fun with our novelty BBQ Branding Irons, Brand your steaks rare, medium or well done so you always get the right one! Vivid Promotional Products offers a BBQ Fork Plus, simply select your meat type, choose a taste preference and start cooking, insert the fork into the meat and the LCD screen will beep when ready. With a large range of Barbeque Sets in stock, Vivid Promotions is sure to have the perfect one for you! With corporate designed boxes and stainless steel tools you can show off your brand in style. Outdoor Adventure Sets are a classic designed promotional item containing everything you need for your next outdoor adventure- Binoculars, Pocket Knife, Torch, compass and rain poncho are packed together in a printed nylon pouch for convenience. Camping Accessories such as Leisure Fishing Sets, Pop Up Tents, Travel Sets with Pillows, Chiller Buckets and Adventure Survival Packs are fantastic gifts for your customers, or to hold stock of in camping and outdoor stores. For an outdoor adventure to remember, Vivid Promotions outdoor Picnic, BBQ and Camping promotional products are sure to enhance any outdoor experience every time. For more fantastic Outdoor Picnic, BBQ and Camping Products take a look at our Outdoor and Leisure Category or our Picnic, BBQ and Camping Sub Category.